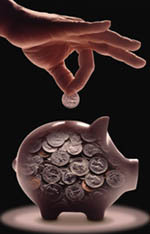 Regular share savings accounts, similar to passbook savings accounts, can be opened with as little as $5.00. Must maintain a minimum daily balance of $5.00 in your account to avoid a service charge. If your balance falls below the required minimum daily balance, your account is subject to a service charge of $1.00 per month. This fee will apply to account holders 18 years of age or younger.